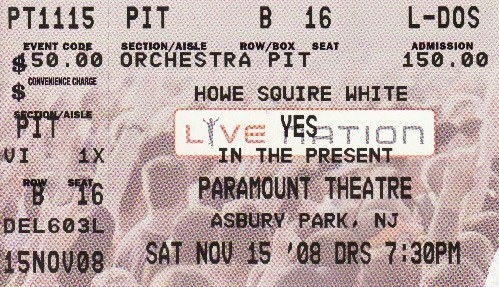 This was my third Yes show (saw them in 2002 and 2004). Since I'm 20, I never got to see Yes back in the 70's, like I wish I could have. I was a little reluctant about going to see them on this tour, since Jon and Rick weren't going to be part of it. But I eventually decided to go. I went with my dad and my uncle (who have been die hard Yes fans their whole lives and seen them over 30 times. I also went with them to my other 2 Yes shows). I'll admit, I was a little disappointed with the sound. Steve and Benoit were too low in the mix, and Chris' bass was WAY too loud (although it did make for an earthshaking performance of The Fish!) Steve's acoustic guitar on All Good People was almost completely inaudible, although I blame Paramount's acoustics for that. Another big bummer was the dropping of Machine Messiah (along with Heart of the Sunrise and Owner of a Lonely Heart) which was one of the main reasons I went to see them on this tour. But when I found out the next morning this was due to Alan being sick, I was amazed, as he looked and played almost perfectly during the show. Thanks for battling it out, Alan! Now that we've got the negatives out the way, I can say that I very much enjoyed the overall performance of the band. I was very pleased with Benoit's vocals (even though he flubbed one of the verses on Tempus Fugit). He sounded very close to Jon, and I particularly enjoyed the performance of Onward. I have never seen Steve this animated during a show. He was jumping around the stage like he was in his 20's again, which was nice to see (always good to see everyone happy and healthly). Astral Traveller was a very nice surprise, and the band turned in a stellar performance of Close to the Edge. Nice to see Parallels back in the set as well, since it's been decades since that was last played. I think that the highlight for me was Starship Trooper. I have always wanted to see them play that, but they didn't play it at either of the two prior Yes shows I attended. I never really liked Roundabout that much, although I thought they played it very well here. I was a little disappointed by Oliver's playing, though. He botched a lot of riffs and was very inconsistent at times. Overall, I though he did a good enough job, and it didn't drag the band's performance down at all. Then again, he only had a short time to learn a lot of very difficult and complex music (and memorize it all!) so I have to cut him some slack. Overall, this was a very nice performance (though slightly marred by unbalanced sound mix). I look forward to next tour. Thanks to all band members, stage crew, and fans who make each show such a great experience. God bless all! * I have a strong distaste for those fellows because they are not professionals. They are hired hands who act like they are tough, and in order to remain on the job, they _act the part_ and will do things that are just SO WRONG in order to look good. I felt the same way about the "Security" guy outside of O'Toole's before the show. Upon entering, I walked right by him, he didn't say a word. I go outside to answer a call on my cell phone and when I tried to go back in, he puts his arms in front me, barking "I NEED ID, I NEED ID." I felt like saying, "Dude, i just walked by you." He was too busy chasing people who were trying to walk around outside of O'Toole's with beer. * OK, rant over. On to the great stuff - the show! This was my first time visiting the Paramount and although the sound could have been better I was pleased with the facility overall. Thank god we didn't have to go to the old Convention Hall for the show! That place is General Admission and it gets god awfully hot in there! I did not know that Alan was ill until after I got home and read some of the first reviews. I suppose that would explain why we didn't get "Machine Messiah". I was quite disappointed that we didn't get that. I'm sure we'll get a chance to hear them play it again next time they come round. But, kudos to Alan for hanging in there. He played lights out on everything! At first I thought we didn't hear "MM" or "OOALH" because of Stage Union rules. If I recall, the show ended exactly at 10:59PM. I just figured they'd have to pay Overtime wages. "Onward" - This was absolutely fantastic. One of my favorites from Tormato. Astral Traveller - Spot On! Steve was soooo good during this one! Tempus Fugit - Didn't care that Benoit messed up, it was still great! I love Oliver's "Yes, Yes" sigh's on that. Aliens Are Only Us: Hadn't heard this until that night - I love it. I cannot wait until I have a recording of it. I thought the band played very well overall. A few hiccups, but still rocked! When Chris-Alan-Steve get together they just play well, you know what I mean? You just feel it. Chris' bass was WAY loud, and I loved it. I thought Steve and Benoit could've been a little louder in the mix. I will agree with some other reviews about certain songs that have the "Jon" effect. AYAI musically came off well, like it always does - it takes you to another place, really. But without Jon singing it just didn't feel the same. I'm sorry to say that, it's just how I feel. I didn't have a problem with "Soon", however. Steve is just in the zone on that one, and although Jon vocally is very strong on that one I was able to appreciate Benoit's delivery. Other than those two - I thought the selections were excellent. I almost forgot - "Parallels", THE ONE SONG I had not heard ever in 13 Yesshows (since 1998). During those 13 shows I've heard GFTO, TOTC, WS and Awaken many many times, but not Parallels. It is such an underrated tune, I am so so so so happy Chris (I'm assuming) wanted to play it. I read earlier that people felt Benoit had a tough time with this one. It is certainly understandable, the next day after the show I played it 5 times in a row in my car and "tried" to sing it, and damn it is HARD! Bravo, Benoit for giving it your all on this one! I guess that's why Jon doesn't like doing it! This was the first show I saw on this tour. The Paramount Theater in Asbury Park NJ is a fairly small venue, with good acoustics for sound. I met my old friend Bill Brown up there, and we proceeded to run into a number of old YES friends from over the years. We were originally slated to sit in the balcony, but were lucky enought to upgrade our sets at very minimal costs to Row J, slightly left of center seats! The show started off very well. 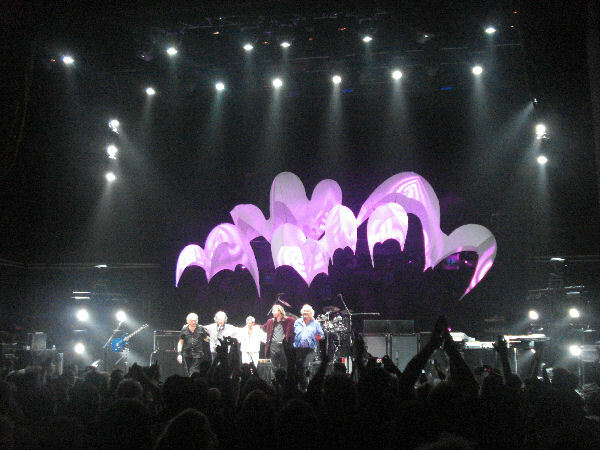 The band's playing was pretty hot, with Steve Howe and Chris Squire particularly animated, moreso than normal. Benoit David really channeled Jon at times, but also lent his own spirit and skill set to the concert. Oliver Wakeman had some issues with his monitors during the show, and his keyboards were relatively buried in the mix. I was able to hear his talents much better the following night in Baltimore. With Alan White not feeling well, the band dropped a few songs from the setlist. You can see he was not well, very pale in color, and lowered energy level. Sadly, as noted by other commentors here, there was an incident between a fan having a good time and a security goon. I was one row behind, and about 6 or 7 seats away from the guy who was assaulted by the security guard. it was a very disturbing event, and he did not deserve that fate. It ruined the mood for me, and everyone else in the area. OK - I was sitting in the pit and saw it all. First, I was pissed that this one guy who was not sitting in the front row work his way up to the front all night long. This was the same goofball who was selling tickets out front, and who had seen them the night before in NYC. OK so everyone gets excited when they play, and everyone wants to rush the stage, but the security guard & his son made it very clear first on that they needed space in front of the stage. The guy in the black spoke to the front row before the concert even started and basicly said you could do what you want-just leave the clearance in front. The loud mouth was picked off by security about 4 or five times before any of this happened. So there was really no issue - just one guy anoying everyone. Now - back to the important issue at hand - The show was awesome. Let me say there is no replacing the voice of Jon Anderson..... however, this guy did a great job. Chris, Steve & Alan were as always played like it was 25 years ago. As for Wakeman well, what can i say - he too did an amayzing job! I have seen them in MSG, Charles Ives, The Beacon & out at the Meadowlands (IZOD). Each one better than the next. I just don't understand - what was up fans? This was the strangest thing - no one stood up?!?!?!?! I was in the 2nd row pit and felt bad standing up - as the entire theater was sitting down. I was thrilled to hear that we were staying at the same hotel as the band. My boyfriend met Steve several times - and on Sunday morning I too got to meet Steve. I was a little disappointed - when my boyfriend asked him for his autograph, he caught attitude and refused. All and all - a great show! I was in the first row in front of Chris and thought the show was great. I too would have liked to have heard Machine Massiah and south side of the sky but will take away that I saw a great show with the persoel at hand. I lovbe Jon but these guys want to play and tour and I quite frankly they are fed up with waiting until he is good and ready to play. I'm thankful for Steve Allen and Chris soldiering on, again Thanks fellas! The sound was good I got a heavy dose of Chris being he was right in front of me. Steve I noticed was using Line6 amps instead of the usual Fender Twins He has used for Years. This may have been responsible for his sound being a little underdone. Chris is amazing to watch and to see his face light up when we roared with delight at his mastery was awesome. How can you not love these guys. I hope Jon will Recover fully and return better than ever but when he can't or won't tour its nice to know that the band can still bring us the Music live Again Thnk You Guys, The big guy in the Yankee sweatshirt! This was another great version of Yes. 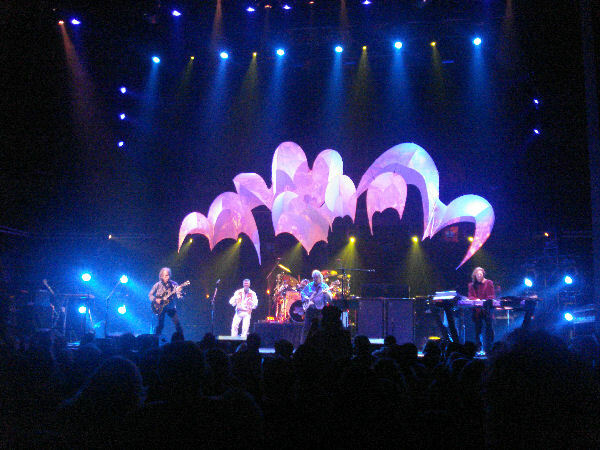 I did the I'm not going to see Yes thing when they did 90125 Tour because Steve Howe was not with them. I regret this. After all I loved the 90125 album and went to Drama and loved Drama too. I guess we all just have our Favorites and I have only missed the 90125 tour since Tormato. Every Version of Yes was great. They need to keep touring to stay tight as musicians. I was in the 10th row and did see this security guard making everyone get back in their seats and on my side where Chris Squire was Rocked out. Some security people are there to knock heads. The Show started out messed up with the parking problems becuse of the Staind Show next door at the Convention Center and no Parking Garages. We parked 2 blocks away and 4 blocks back. It was pouring rain. We walked in and when we got to our seats Firebird suite started. Yesshows are always so Magical and I knew right away that this was going to be another Magical Yesshow. They played all the songs on the setlists I have seen except for Macine Messiah, South Side of the Sky, Owner, and Steve did the other 2 songs not Mood or The Clap. Although the one sounds like The Clap. The crowd started out seated and was standing after everysong. Steve was on fire and was walking around the stage and to the front of the stage for recognition because the crowd was there with them. By the end of the Yesshow we were all stading and dancing. 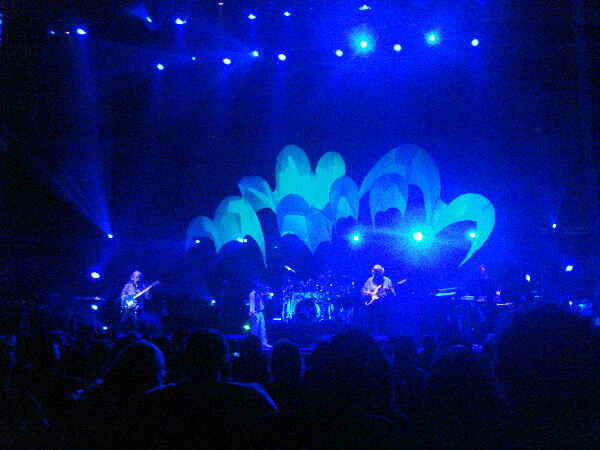 There were obviously alot of people who havent seen Yes in a while becuase people around me kept asking me what song was that one again. They knew it but just havent been listening to or going to see Yesshows in years. Alot of people missed Parallels after the break because the lines at the only 2 bathrooms and getting drinks were all only upstairs and took the few attendents,making drinks very long to fill orders. This was a great Yesshow and you should try to get out to see this "In the Present Yesshow Tour". I mean Peter Banks, Trevor Horn, Geoff Downes, Trevor Rabin, Tony Kaye, Patrick Moraz, Billy Sherwood, Bill Bruford, Rick Wakeman, Igor Khorachev, Adam Wakeman was and may have done a leg of the European Tour at one time. One of my personal Favorites was when they did the Yessymphonic with Tom Brislin on Keys. He was so Exciting to listen to and watch as a Fan. I was at all. Except for Peter Banks and Patrick Moraz. All were good then and Yes is still good now. David was not Jon but the Yeshow was there my Yesfriends. We can now add Benoit David and Oliver Wakeman to that long list of Yes that we have all come to love no matter what. Yesfan forever Goin4the1.... Rob Sanchez...First Magical Yesshow in 1979 and this Yesshow last night was just as Magical and great. See you all at The Borgata on Friday. Yes, Alan White was quite sick. You could hear it and see it. He looked like a ghost, was all sweat...must have had a fever of 102! Nice job anyway. They cut the songs on his request, just as Howe was about to intoduce MM, he told then he couldn't do it, to go right into Soon and Trooper. He left the stage again...likely to yak. Now..the security guard......Looked like a big fan of "Dog, the Bounty Hunter." This guy was dressed in all black with his "shades" on the whole show. He was at the Squire side pre-intermission, and Howe side after. He was directing his young partner (red shirt) all night. During Parallels, he motioned his partner to stop the three fans returning to the pit. These folks had front row seats! When Brian started to argue that he indeed had a front row seat and showed him his ticket asking why he couldn't return to his seat, "why are you not letting me in?" Red shirt just repeated that he had to wait until the song was over. Brian was clearly pissed. Then.......Dog started to walk over....Brian would have been DOG MEAT if the song didn't stop, luckily he was let in then and Dog turned back....you have no clue how close you came Brian....should open your eyes sometimes and take a look up. Anyway, During Starship Trooper Dog (who was also opening wearing some kind of Shield on his belt) went back and yoked this guy. What a douche move from a big fool. Shame on you Dog, shame on the Paramount for hiring you, and paying you. If indeed you are a public servant and not just a cheap fool rent a cop, the victim should sue whatever township you work for.....You openly assaulted someone while displaying a Shield. Lots of witnesses. Ever hear of "Excessive Force?" This was an incredible show. Steve and Chris were having a blast and appreciated the audience's sustained passion for their music. If you closed you eyes and I told you the vocals were coming from Jon Anderson, you would believe it. Benoit David is perfection. I had heard rumors that Oliver was the weak link, but I have a take on things that some may have missed. He plays without flash, in a classical "Yes" manner, like his dad, which I thought, was outstanding. You have to understand who he is and his mindset to appreciate him. He is still learning how to mesh with the music on tour - most notably, the timing - but apparently, he has improved over the last few shows. I came away loving he was there. 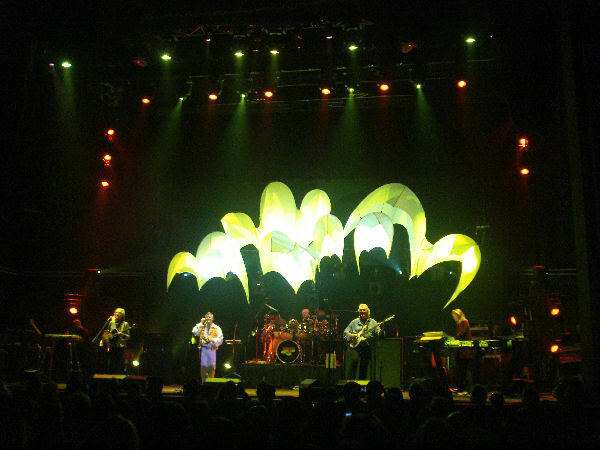 The first time I saw Yes, I was 13. Close To The Edge blew me away that day. It was a life marker. It has touched my soul forever. Of course, Yes performed it brilliantly again last night. Oliver was especially good here. I took my 13-year-old son last night. He commented to me how incredibly impressed he was with Yes' musical abilities and unique sound and questioned why they aren't more popular. This was his Yes maiden voyage. They touched his soul, too. A great moment as a dad. From this day forward, Yes will be the music by which he measures all others. In closing, I would like to ask everyone an important question: How many bands sound this good at this age? Regarding the incident with the security guard, I wasn't at this show but I read the post and somebody should call the venue to complain. I hate it when testosterone filled hotheads overstep their authority - behavior like that from security guards should not be tolerated. I read something on yesfans that Alan had the flu and that's why the songs were dropped. Or could it have been the venue had a cerfew? I missed the dropped songs as well. That said, I had a blast last night. I was worried that parking would be a problem and that the venues restaurants wouldn't be prepared for all the people (Staind was playing at the convention center which is on the same piece of property). However, the venue and surroundings experience couldnt' have been better for us. We parked almost directly across the street in a lot for people with yes tickets. For free. There were little blackboards saying this.. Parking only for yesfans. We watched the 4 cars in front of us being turned away then we pulled up and the guy asked who we were going to see, then looked at our shirts and laughed and let us in. We ate at the SaltWater, just across the boardwalk. The staff was wonderful. There were cheery and happy. Our waitress was soo excited to see so many people 'Isnt' this great?' she asked. Part of re-vitalizing Asbury Park, I guess they aren't used to crowds, and crowds mean money spent. Food was good too. I found the Paramount staff to be just as happy and bubbly to see us. Totally polite and seemed to be enjoying everything. And the show?! Was a blast. This was close to my 50th yes show, so I've seen them a few times before. I missed Jon. I love Jon. But this guy was good. I wish they'd turned him up more in the mix. I liked watching him dance. He looked like he was at a dead show. Steve was more animated and fun to watch than he's been in awhile. Chris - who's gained weight again, and his hair's much whiter than last I saw him - was spot on. I thought the keys were weak. Little Wakeman had little onstage personality, I missed Rick's grandeur. CTTE lost some of it's power I thought cause of the weak keys. My 17 yr old daughter thought Alan was weak. Perhaps if the flu rumors were true, that would explain it. She thought that was why the WOW moments were less wow - alan's not being quite "on". Where I attributed it to Wakeman. Bounced like crazy thru roundabout! I worried it wouldn't be Yes without Jon. It was. I would have loved it MORE with Jon. But I loved it anyway. We ended the night w/ a stroll on the beach. The rain held off. The temperature was mild (tee shirts). I witnessed the event first hand.That poor guy did nothing wrong.I think thats the reason there wasn't a second encore,which is usually a YES live trademark. As far as the show,Machine Messiah and South Side of the Sky being dropped was saddening enough already. I will blog about this later on MySpace.com//johnbassvox.Check it out if you can. Okay�show started out great. We had seats close to the stage. Sound was muddy up close, much better in back, but we chose to stay close. Yes the band sounded a little rough; yes Jon and Rick were missed but we where having a great time. This changed after the intermission. A different security guard was posted to the left of the stage for the second half of the show. This guard was very intent on keeping anyone out of the aisles. Should someone step into the aisle even partly for any reason this guard was right there to return him or her, sometimes physically, to their seats. Well this was at worst just a distraction with this guy constantly up and down the aisle and back and forth in front of the stage, an annoyance. It was even comical at times, with many fans looking at each other and shaking their heads. As the band started playing Starship Trooper they had the fans on their feet, clapping their hands and yes, a few were dancing in the aisles. Well the guard could not allow this and rushed to put a stop to it. Now as this guard was young, well built, very muscular and with attitude the few fans returned to their seats. All that is but this elderly white haired gentleman. Guess he could not contain himself. He returned to this aisle and continued to dance. This is when the guard roughly pushed him hard down into a seat. The fan then stood up. That�s it he stood up. Shouldn�t have done that. Next thing we knew this guard had the fan bent into a chair and he was down on top of him and while I don�t think he punched the fan, he was pushing hard, pushing hard with his hands physically assaulting the fan. The poor man was terrified. We fans in the area where horrified. Again this was a young very well built guy beating up an old man more than twice his age! We were all horrified! I tried to intervene, tried to hold this guards� arm back but I�m 55 myself and not in the best of shape, all I could do was beg this guy to stop beating on him. At last two women guards came to the rescue convinced the guard to get off the fan. They brought him to the back sat him down and got him some water. He declined to make anything of it. Happy I guess just to be alive and unhurt. Needless to say for my wife and I and the fans that witnessed this, the concert was ruined. We barely noticed the encore. It was horrible. I would love to hear from anyone else who witnessed this.